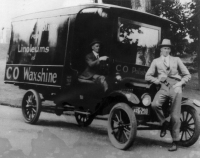 Established in 1923, CO Products Limited manufactures and distributes a range of oils and waxes used to clean, polish, protect and restore furniture, floors and many other surfaces. Founded by Minnie Bardsley in a small wooden building, the company still operates from the same site close to Wellington Hospital in Newtown. The first product produced was the classic CO Polishing Oil, followed soon after by our natural wax polish, CO Waxshine. Both products are still manufactured today using Minnie’s original recipe.